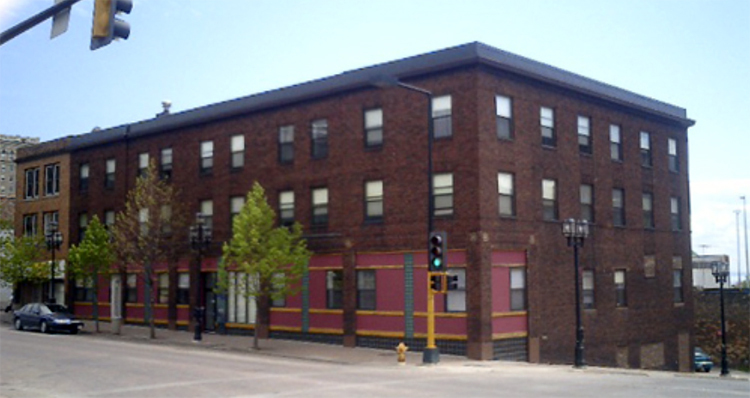 Duluth’s Frances Skinner Apartments at 102 East First Street were named for social activist Frances “Fran” Skinner, a native of Topeka, Kansas, who was born in 1918. She earned her teaching degree at Eastern Michigan University and masters from the Universities of Michigan and Minnesota. While she did do some teaching, there is no indication that Miss Skinner ever taught kindergarten or had an interest in real estate. Skinner began her career in social work in the Twin Cities in 1941; ten years later, her work brought her to Duluth as the executive director of the International Institute. After a ten-year tenure, Skinner left the institute to teach sociology at the University of Minnesota Duluth, where she helped develop the School of Social Development. She retired from UMD in 1979 to serve as the president of the Duluth Community Action Board. She was widely involved in Duluth, displaying a lifetime of concern for her community, particularly where low-income housing was concerned. She belonged to the Low Income Housing Consortium, Northern Community Land Trust Fund, the Minnesota Housing Trust Fund Advisory Board, and served as president of the North East Minnesota Housing Partnership and the Duluth Housing Trust Fund. In 1990 Skinner’s life in social work was recognized by Governor Rudy Perpich who presented her with an economic and social justice award. It is only fitting then, that when the Toverilla Hotel (b. 1917) was converted into low-income apartments, the building was renamed to honor Skinner. Fran Skinner was also involved in other aspects of life in Duluth. She volunteered at the Peace Center and became involved in the John Beargrease sled dog race. She coordinated the International Folk Festival, which was held annually at Leif Erikson Park, for ten years. She lived on Minnesota Point and belonged to the Park Point Community Club. Skinner has been honored by Duluth’s Whole Foods Co-op through the Fran Skinner Matching Memorial Fund. Skinner helped establish the co-op back in 1970, serving on its board, managing the business from 1974 to 1988, and pitching in on inventory up until her death on February 6, 1994. She was seventy-six years old. According to her obituary, Miss Skinner left behind a brother in Tennessee and her long-time companion, Jo Goodsell.